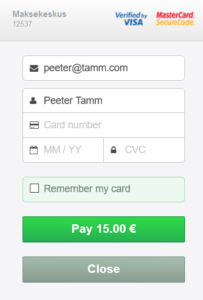 The dialog is implemented as semi-transparent iFrame window on top of the shop’s checkout page. This approach is recognized by card networks as IFRAME solution that set the lowest PCI DSS compliance requirements on Merchant. (VISA guide to security and PCI DSS requirements). We do not accept any other form of credit card payments. This approach ensures that credit cad data do not pass through the Merchant systems and PCI DSS V3 SAQ-A attestation for the Merchant is not strictly required. For further integration details see our api-explorer. 3DSecure is an additional security measure that involves user authorisation at card issuer bank during the online card payment process. See more on Wikipedia 3-D_Secure page. 3DS protects merchants better against chargebacks of “unauthorised transactions” – the user can not simply claim that he has not done payment. The downside is additional steps on the purchase flow, the exact flow depends on the specific implementation of the authentication dialog at the home bank. With One Click Payments activated for your shop, a credit card can be ‘remembered’ in MK systems so that the buyer does not have to fill the card data form again at next purchase. The user virtually needs just one click to pay. Read more about it on OCP page. We offer a solution for merchants to take recurring payments from credit cards. Read more about it on recurring payments page. Merchants who run shops oriented to UK or USA markets and would like to service buyers in their domestic currency can take credit card payments in USD and GBP. Settlement between MK and merchant still is done in euros but the buyer credit card is debited in his/her familiar domestic currency. Read more on non Euro payments page. You can try yourself the Credit Card Dialog in our demo shops, using the test cards.